A toddler was strangled by his own T-shirt after it got caught at the top of slide he was playing on in his back garden. 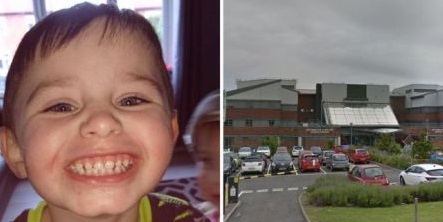 Blake William Graves, three, died in hospital the day after the accident at his family home in Crook, Co Durham. An inquest heard how his T-Shirt snagged on a screw that was protruding just 6mm after it had been used to fix a handle. As the toddler tried to slide down his top caught and put pressure on his neck which stopped him breathing. The three-year-old had been playing in the front garden of his family home on July last year with his little sister and mum. The three went to the back garden before the mum took the girl inside where she watched Blake from a window, where her view was sometimes obscured by a dog kennel. Detective Inspector Neil Jones told the hearing, at Crook Civic Centre, that Blake’s death was a tragic accident. CCTV footage from a neighbouring property showed Blake had been in the rear garden just short of 20 minutes before his mother ran out of the side door of the house into the back garden. She was then seen carrying the boy, who was not breathing and no longer wearing his top, in her arms. She called for a help and a neighbour tried to resuscitate him before an ambulance arrived and took him to James Cook University Hospital, in Middlesbrough. He died there in the early hours of the following morning. Det Insp Jones said: “What was quite clear was the slide is a good few years old, with wear and tear it had been knocked about a bit and many repairs had been cobbled together to keep it going for the kids to play on. “The one remaining handle is where the repair had been done. “I understand why, with a wood screw, to keep the handle sturdy for children climbing up to grab onto. The inquest heard that the slide was designed to have countersunk fixings so originally everything would have been smooth so there was nothing clothing could be snagged on. On the day of the tragedy, the back of the slide was lifted slightly off the ground using a child’s trampoline as the youngsters had previously used it to slide into a paddling pool at the bottom. Det Insp Jones said unfortunately the elevated degree would have increased the pressure from Blake’s bodyweight. Jeremy Chipperfield, the senior coroner for the County Durham and Darlington, said a post-mortem examination showed Blake was a healthy boy who died as a result of asphyxiation and pressure to the neck.